You know what’s handy? Waking up in the morning, firing up your phone/computer and being able to scan a super quick (but curated) rundown of the best of what lies ahead. So here it is, our list of fun things to do in Los Angeles for today, Sunday, March 17, 2019. May it lead you to adventure! Keep in mind for some of the ticketing options we utilize affiliate links and receive a commission if you purchase through our links (affiliates noted in parenthesis). 1. [6 a.m.] The St. Paddy’s bash at Brennan’s in Marina del Rey will feature bagpipers, green beer and live music from several bands. 2. [9 a.m.] The Sierra Madre Wistaria Festival returns for 2019 with another special viewing of the world’s largest blossoming plant, plus 200 arts, crafts and vendor booths, and live music. Paid shuttle service is available to and from the private residence that contains the plant and the main festival area. 3. [9:30 a.m.] L.A. Nature Fest comes to The Natural History Museum L.A. (NHMLA) March 16-17 for two days of performances, hands-on activities, exhibitor booths, nature walks and more. 5. 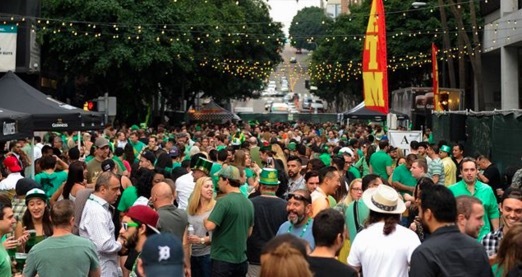 [11 a.m.] Casey’s St. Patrick’s Day Street Festival will shut down four blocks in downtown featuring DJs, dancing, Irish whiskey and beer, and more. The street fest will run from 11 a.m. to 2 a.m.
6. [11 a.m.] PAC-MAN and Donkey Kong fans rejoice because the Arcade Expo is returning the Museum of Pinball in Banning from March 15-17 with some 1,100 retro and modern arcade games and pinball machines. 7. [noon] Annual St. Patrick’s Day celebration at The Original Farmers Market is a free family friendly Irish-themed day featuring Irish fare, drinks and traditional music like a strolling bagpiper. 8. [noon] KROQ Presents: Flogging Molly St. Patrick’s Day Block Party at the Hollywood Palladium on Sunday. The block party includes all kinds of fun activities like street games, delicious food, plenty of Guinness, prizes, music, and more. The block party is free but you will need tickets to catch the Flogging Molly concert. 9. [1 p.m.] Daft Brunch LA will host a St. Patrick’s Day celebration at Resident in Downtown Los Angeles this Sunday. Expect Daft tunes, food, dancing and music by special guests including DJ’s French Touch and Disco House. 10. [noon] Obvious Plant’s Museum of Toys will house over 100 items created by comedian Jeff Wysaski including fake toys, actual toys with new names, and actual toys with fake facts. The show runs March 1-17 at Start Los Angeles, in Harvard Heights. We Like L.A. staff articles are compilations created by our site editors.